Our village began a process of transformation to welcome the 44th President of the United States Barack Obama and his wife Michelle after he announced he was coming to visit us from the Oval Office of the White House on March 17th 2011. Moneygall with a population of about 300 located on the Offaly Tipperary border was immediately in the spotlight of international media and we wanted a picturesque village to be displayed worldwide. With the assistance of Dulux paint each house was decorated with a fresh coat of paint and the Tidy Towns committee got into full operation with a huge cleanup. 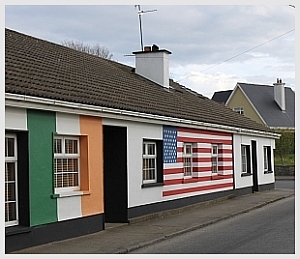 Offaly County Council immediately assisted in the village upgrade and repaired and replaced various forms of public infrastructure with the creative idea of flagpoles and flags coming from our County Manager Pat Gallagher. Moneygall was a hive of activity and before we knew it Monday May 23rd was upon us and the village was in lockdown. Residents of the village were asked to vacate houses by 11:00 and make the way to the end of the village to enter the viewing area before President Obama & the First Lady arrived. 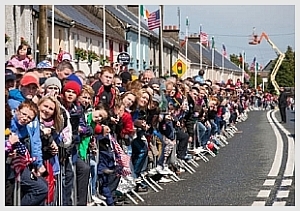 The population of Moneygall multiplied by a hundred as three thousand people who were fortunate to get tickets to enter the village queued patiently to go through security screenings. The atmosphere and excitement was electric and not even the harsh weather conditions could dampen the spirits of Moneygall who was about to welcome home an ancestral son. 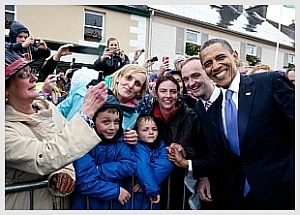 President Obama was coming home to visit the village steeped in his ancestry and Moneygall was going to make an impact by ensuring he got the now famous “Cead Mile Failte” (One hundred thousand welcomes). The rumours were a plenty that the President was unlikely to travel and that the unseasonal winds would prevent Marine One from travelling but like the Presidents campaign we did “Believe” and “Hope” the weather wouldn’t be a hindrance to this visit. The sounds of the Helicopters arriving to Moneygall were greeted with loud cheers as those on the street for numerous hours now realised that the President had arrived at the GAA grounds St Flannans Park as planned. The rain was still heavy but as the Presidential motorcade took the turn onto the Main Street of Moneygall, it stopped and the sun began to shine. The symbolism of the sun bursting through the clouds will be one which will mystify many for years to come. The President and the First Lady emerged from the SUV which they were travelling and were greeted on the Main Street by Offaly Co Co Chairman Cllr Danny Owens, North Tipperary Mayor Cllr John Kennedy, and the Presidents 8th Cousin Henry Healy. The President & First Lady after chatting with the greeting party moved over to the 3000 assembled and began the longest ever meet and greet by the President and First Lady. The President and First Lady broke away on two occasions from the crowd as the President stepped inside his ancestral home. The Kearney homestead still stand somewhat modernised in Moneygall, and the President seen an artist impression of the house as how it would have stood in 1850 when his great great great grandfather Fulmouth Kearney emigrated. The President stomped his foot on the floor and took time to imagine what it was like for his ancestors to have left this house their family home. e First Lady and President left the ancestral home and went to purchase some gifts in An Siopa Beag and after purchasing some native pottery the First couple returned to the crowd to continue to meet and greet. The next stop was to Ollie’s Bar where Canon Stephen Neill was on hand with the Parish Records to inform a very interested President about the information contained in the registers dating back to the 1700’s. President Obama greeted the customers of the pub which contained some more distant relatives and the local organising committee. The president sampled a pint of Irish Stout and paid for his round with €50 note. The First Lady tried her hand at pouring a pint as the President practiced his Irish with the patrons. Upon leaving the bar the President side stepped his car and continued along the Main Street to greet those who came out to welcome him. Both the President and First Lady made the way to the end of the crowd and were embraced by many with hugs, kisses or just a warm handshake. Moneygall will never forget the day we welcomed home our ancestral son and we look forward to welcoming everyone to our village to share our experience and our historic day with you! View the video of President of the United States Barack Obama and his wife Michelle during their visit to Ireland including Moneygall, Co. Offaly.